Mandevilla – some species of which are called Dipladenia – are remarkable climbing shrub vines. Caring for both Mandevilla and Dipladenia is almost identical. From planting to pruning and including watering, they should give you magnificent flowers in summer! These plants can be grown outdoors, but they’re most often found indoors in pots. Indeed, the most hardy varieties will just barely survive light frost. They will be happy to spend summer months outdoors, but must be brought inside for the winter in most areas. 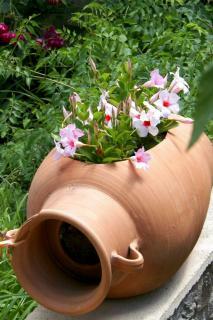 When grown in containers, it is advised to repot every 1 or 2 years, in spring. Indoors, is it best to place them near light, but not in direct sunlight. 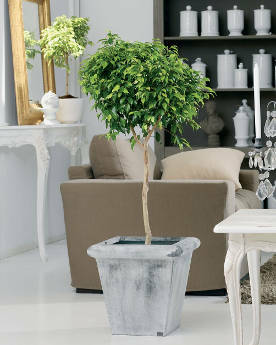 Avoid placing this potted plant in excessively hot sunlight when on a terrace or balcony. Refer to our guidelines on how to repot houseplants. Temperatures of at least 68°F (20°C) are required for this plant to survive. When growing directly in the ground, temperatures must be high in both summer and winter and planting is done in spring. When planted directly in the ground, they will thrive in direct sunlight. In places that are too cold, there is a slight chance that new sprouts will appear from the roots in spring. It’s mostly grown as an annual in areas where it freezes in winter. To boost flower-bearing, remove all wilted flowers regularly. This will trigger new blooms by reducing fruit formation. It is best to prune lightly at the very beginning of spring to spur blooming. For container growing, pruning can be done during repotting. Choose a very well-lit space for your flowering vines, but not in direct sunlight behind a window. Avoid heat sources such as radiators. 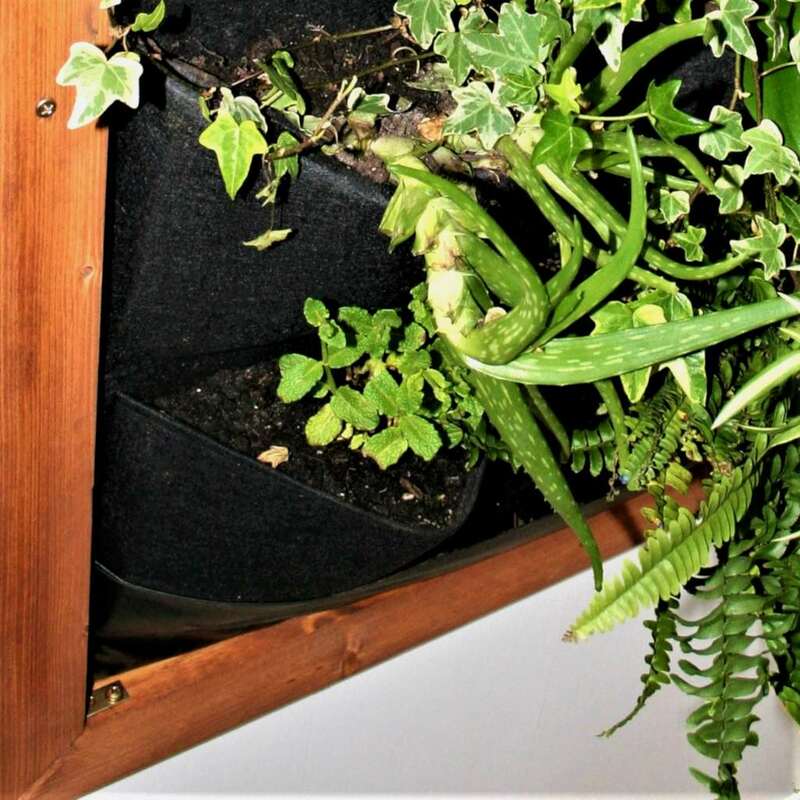 Protect the plant from direct sunlight during the hotter hours if placed behind a window. Water regularly but not too much, to avoid suffocating roots. Finally, bring your growing Mandevilla vine outdoors from May to October to give it fresh air. It’s best to provide a lattice that is firmly attached to the pot for the vine to climb up on. Ensure that the container is sufficiently weighted down or it might tip over if the vine grows too large. 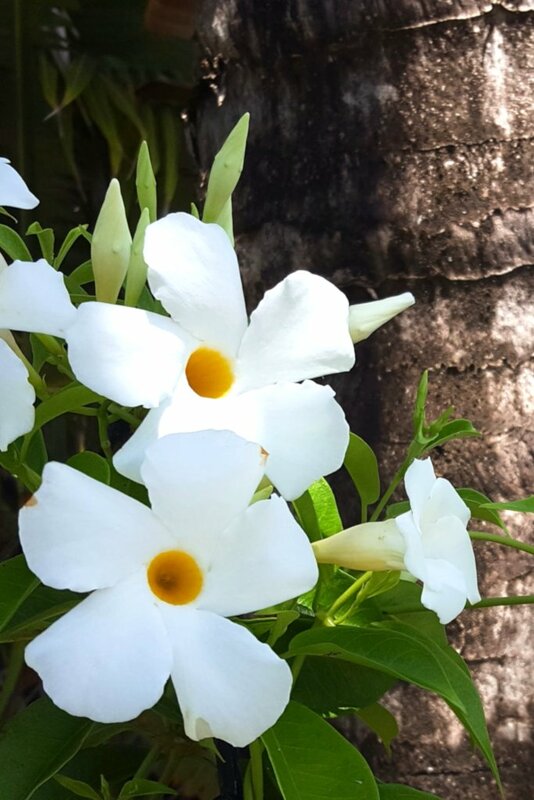 When potted, mandevilla and dipladenia need a lot of moisture and like being placed on a bed of constantly moist gravel or clay pebbles, since this recreates its native tropical environment. The usual blooming season for these vines is from March to November. After blooming, its is best to winterize your plant: place it in a cooler but well-lit room. Ideal temperatures are around 68 to 70° F (20 to 21° C) in summer, and 50 to 60°F (10 to 15°C) in winter. 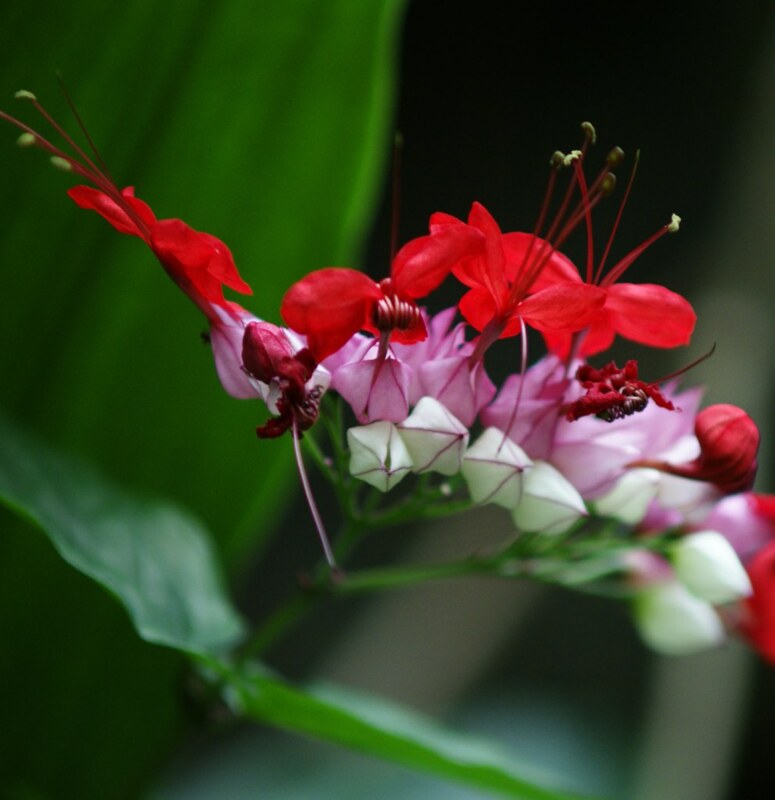 Native to the tropical Americas and part of the same family as oleander, this shrub blooms abundantly over a long span of time with beautiful flowers. Mandevilla does great near walls, lattices, trees or poles where its climbing abilities are highlighted. Dipladenia, on the other hand, will excel in suspensions or elevated pots and garden boxes, from which they can dangle down. They will grow best in greenhouses where moisture levels are high, so if you wish to grow them in apartments or indoors, spray their leaves often with soft water. Mandevilla and dipladenia sap and plant parts are toxic when ingested and irritate skin when touched, so wear gloves or wash your hands after handling them. Bearing – mandevilla tends to reach upwards, whereas dipladenia will fall over and crawl down. Dipladenia can hold a bush shape with no staking. Shrub – dipladenia grows into more bushy, shrub-like shapes, and branches out more naturally than mandevilla. Mandevilla tends to grow further and longer and needs pinching to branch out. Leaves turn yellow when exposed to the cold or to lack of water. Protect your dipladenia and mandevilla from drafts and regularly spray water on their leaves. As for pests, indoors, you’ll only have to deal with scale insects and spider mites. Follow our advice on how to treat scale insects. Here is how to fight red spider mites. Smart tip about Mandevilla and Dipladenia. Adding flower plant organic fertilizer will enhance blooming.